Illustration by Edmund Sullivan from the first edition of FitzGerald's adaptation of Rubaiyat of Omar Khayyam. 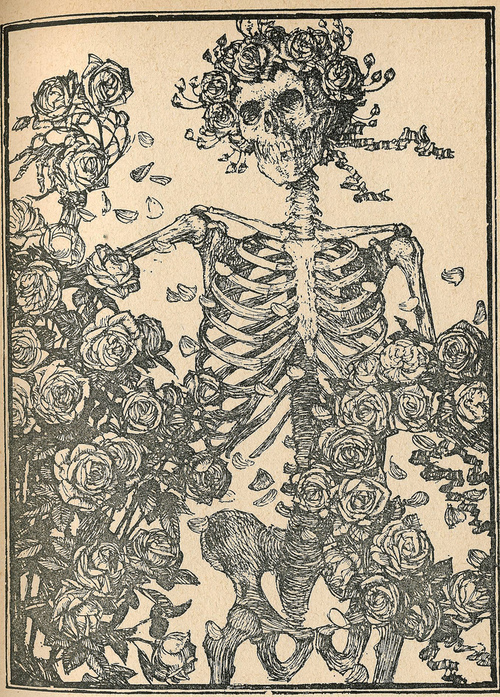 This image has famously been used in posters for The Grateful Dead. Omar Khayyám (1048-1131) is best known in the West for his poetry; ironically, the most famous “translation” of his poems is not very faithful to the original, and (wonderful as it is) properly should be known as an adaptation or paraphrase. However, in his day he was better known in his native Persia (now Iran) as an astronomer and mathematician who helped institute calendar reform. Today marks the anniversary of his death on December 4, 1131. Khayyám was one of many mathematicians who struggled to resolve the problems with Euclid’s parallel postulate, which I wrote about on Friday. Though he stopped short of discovering non-Euclidean geometry, he was thinking about the problem in a refreshingly modern way (though of course given the state of Europe at the time, it was many years before his work would be known there). He also wrote persuasively on the unity of all mathematics, showing how geometry and algebra are not truly separate branches; he famously proved algebraic theorems using pictorial methods. Much of the concern in astronomy in the Middle Ages had to do with accurate calendars, and this is Khayyám’s other major contribution.. As we all know, the Solar System has saddled us with an inconvenient and incompatible set of variations: the sidereal year (the time it takes Earth to orbit the Sun, as measured from the “fixed stars”) doesn’t divide evenly into months (the amount of time for the Moon to complete one orbit around Earth, again measured against the stars) or days (one complete rotation of Earth). To make things worse, there’s another way to calculate a year, based on the length of time between one vernal equinox and another, which is about 20 minutes different from the sidereal year, and the amount of time the Moon takes to orbit is different than the time it takes the Moon to go through all its phases. In other words, calendar systems are quite complicated if you wish to make them accurate! The Gregorian calendar, the secular calendar used in the United States and much of the world, originates with the Roman Julian calendar. It’s based purely on the Sun, with months of varying lengths having no connection with the phases or orbit of the Moon. Similarly, the religious calendar used in Islam is purely lunar: holy days and seasons in Islam (such as the holy season of Ramadan) move throughout the solar year, so that sometimes a holy day may be in summer and sometimes in winter, even though it happens on the same date in the Muslim calendar. The Jewish and Chinese calendars are based on both Sun and Moon: for example, Passover is calculated with respect to first full moon after the vernal equinox. This means that some years have twelve months, but some years have thirteen months, in accordance with the shifting Moon phases over the solar year. It’s a complicated calendar compared to the Gregorian or Islamic calendars, but more accurate than either if what you want is a reconciliation between the cycles of Sun and Moon. The Christian religious calendar has ties both to the Jewish calendar, which is why Easter moves around a lot, and the Roman calendar, which ties Christmas to the same date every solar year. Khayyám’s precise astronomical work led to the Jalali calendar used in Persia until the 20th century; like the Jewish and Chinese calendars, it is based on both Sun and Moon and is far more accurate than the Gregorian calendar, requiring fewer corrections in the form of leap years. The Gregorian calendar requires one leap day every four years, except on centuries—but every 400 years, the century year is also a leap year. (Thus, 1700, 1800, and 1900 weren’t leap years, but 1600 and 2000 were, and 2100 will not be.) Khayyám’s calendar requires fewer leap years, though the calculation is a trifle harder than in the Gregorian calendar. Actually it’s only two! In the Middle Ages both in Islamic and in European culture astrologus, astronomus and mathematiicus were synonyms and referred to the same profession. It’s first in the 17th century that they start to separate out into distinct fields. Fair enough, but they’re distinct disciplines today. It’s difficult to strike a proper balance between examining the past on its own terms and understanding it from today’s perspective. I erred on the side of the latter in this case. Astronomy as we understand it today didn’t really exist in the 12th century, after all. He lived to a good age too. Probably because he lived at the top of the mountain and the water was fresh! I recommend Hazhir Teimourian’s recent biography and reinterpretation of the poetry. I like to mention the great astronomer Hipparchos from Nicaea. It wasn’t astronumy as we know it today but looking at his work from the perspective of his time, he was one of the greatest astronomers ever.